Founded in 1990, Animal Defenders International has offices in the US and the UK and works worldwide to end the suffering of animals with Field Officers working undercover and making detailed observations of circuses in Europe, South America and the US. ADI evidence of circus suffering has led to national and local restrictions on animal circuses across Europe, South America, and Asia. Over 200 members of the UK Parliament signed a motion supporting ADI’s campaign to ban all animal circuses and to bring winter quarters under zoo licensing regulations. Internationally, following a seven-year campaign by ADI, new regulations for the cross-border movements of endangered species with circuses were adopted at the Conference of Parties to the Convention on International Trade in Endangered Species (CITES) in Santiago, Chile. The rules, which are designed to curb the ability of circuses to traffic in endangered species, affect over 160 countries. The CITES rules came about after ADI seized every animal from the Akef Egyptian Circus in Mozambique: six lions, three tigers, an African python, horses and dogs. The circus was widely believed to be a front for animal trafficking and would obtain and dispose of animals as it moved among countries. Baby chimpanzee Trudy was rescued from international animal trainer Mary Chipperfield when ADI evidence secured her conviction for cruelty, when our Field Officers filmed her beating the young chimpanzee mercilessly. Chipperfield was a supplier of animals to the film industry, including Disney, as well as for circuses all over the world. Chipperfield, her husband and their elephant keeper were all convicted; the elephant keeper spent three months in prison. Trudy was put into the permanent care of a UK primate sanctuary. We rescued a chimpanzee named Toto from a traveling circus in Chile in 2003. Having been purchased from a US source, Toto lived in a packing crate with the Chilean circus for over 20 years. He now lives with other chimpanzees in over 14 acres of natural bush in Zambia. 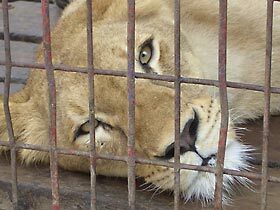 ADI has relocated lions from Italy, and lions and tigers from a circus in Portugal, to the ADI sanctuary in South Africa. We have rehomed primates, lions, tigers and other animals in sanctuaries. In 2008, the ADI Stop Circus campaign is being run in the USA, the UK, Ireland, Greece, Portugal, Norway, Bolivia, Chile, Colombia, Ecuador and Peru, with many other ADI resources and expertise being utilized in many others.